Much has been said over the last week about Real Madrid coach Carlo Ancelotti’s decision to persist with Cristiano Ronaldo as his number one free-kick taker. The Portugal international posed a major threat from set pieces in 2013-14, scoring four goals from 43 attempts in La Liga and the Champions League. This season, however, the Fifa Ballon d’Or holder has lost his touch, failing to find the net even once from 30 efforts. Ronaldo would be wise to watch Bayern Munich star David Alaba, who is now developing into one of the world’s most dangerous dead-ball experts. In the first half of this campaign, the Austrian was second in the left-footed free kick hierarchy behind Arjen Robben. But the 22-year-old has now dethroned the Dutchman as Pep Guardiola’s first option after a string of stunning strikes. Alaba opened his account in the 2-0 away win over Stuttgart back in February and repeated the trick in the DFB Pokal victory against Eintracht Braunschweig. When the referee awarded Bayern a free kick on the edge of the area shortly before half-time in the 4-0 win over Werder Bremen on Saturday, there was only going to be one result. Alaba again showed his set-piece prowess with a stunning curler that left goalkeeper Raphael Wolf with no chance. The left-back, who has also regularly featured in midfield in 2014-15, has now netted three times from free kicks in his last nine appearances in all competitions. Although Zlatko Junuzovic, Hakan Calhanoglu and Johannes Geis have all converted more free kicks than Alaba in the German top flight so far this campaign, the versatile midfielder has had far fewer set pieces than his three rivals. Whereas Calhanoglu and Geis have taken well over 20 free kicks, Alaba has only had eight attempts, resulting in a conversion rate of 0.25 (see graphic above). This puts him on par with Junuzovic, who has four from 16. With Alaba now at the top of the pecking order at Bayern, he is only going to add to his tally in the coming weeks and months. The Bayern star has already emulated former Brazil international Roberto Carlos in becoming the best left-back in the world – and he now seems destined to surpass him in the free-kick stakes. Ronaldo, meanwhile, can only hope his free-kick drought soon comes to an end. 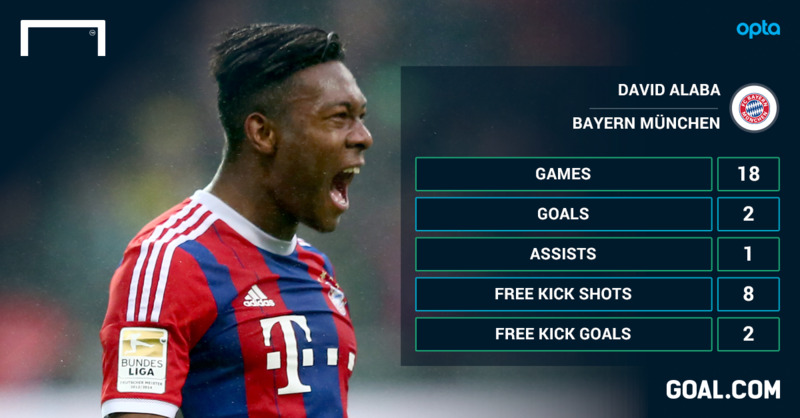 The ex-Manchester United man could certainly learn a thing or two from Alaba.